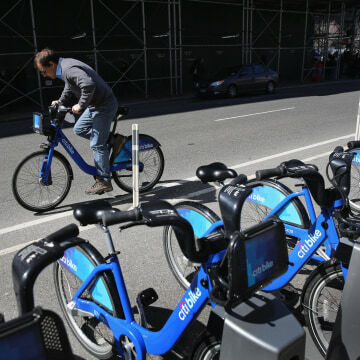 Despite some financial and legal challenges, bike-sharing programs are rolling out in cities throughout North America. Locals and visitors in Minneapolis, New York, Washington and about 30 other North American cities can now buy daily, weekly or annual program memberships or pay hourly fees to check out a bike to ride around town. Cities such as Tampa; San Diego; Portland, Oregon and Vancouver, British Columbia, will soon be launching programs. Seattle is the latest city to announce that it is joining the bike-share bandwagon, with a start date in September for Pronto Emerald City Cycle Share, which will kick off with 50 docking stations around town for 500 blue and green bikes. As in other cities, grants, private sponsorships and user fees will make the bike-share program possible. But with a contribution of $2.5 million from Seattle-based Alaska Airlines, the Emerald City is the first to have its bike-share program sponsored by an airline. "We're excited to help residents and visitors get out and explore," said Joe Sprague, the airline's vice president of marketing. "Our investment in this program is an investment in our community." It may seem odd that a traditionally fuel-guzzling form of transportation is supporting a very green one, but Alaska Airlines has a strong sustainability program. "Biking in a city puts smiles on people's faces, and airlines want to be associated with people having fun while traveling," said Andy Clarke, president of the Washington, D.C.-based League of American Bicyclists. That fun has bubbled over to political and policy decisions in other cities. "When Paris introduced their system a decade ago, it was striking how many mayors around the world said 'I want that,' " said Clarke. And biking through a city is no longer seen as unconventional. "Maybe 10 years ago biking would have been a granola effort in the sense that people choosing to bike were part of the environmental movement," said Joshua Schank, president and CEO of the nonprofit Eno Center for Transportation. "Bike-sharing has helped change that. In places like Washington, D.C., and Chicago you see people in suits and ties riding the bikes because it's a convenient and effective way to get to work. Not because they're saving the Earth," said Schank. While setting up a bike-share program may seem as easy as putting up some racks with bikes, "it's complicated and not cheap, easy or free. There's a lot to it," said Clarke. And these programs are not without flats. In January 2014, Montreal-based Public Bike System Company (known as Bixi), which provided bike-share equipment to programs in several countries, sought bankruptcy protection with more than $44 million in debts. Contributing to the company's financial downfall was a problem with the software for bike docking stations in some major cities, which caused those cities to withhold payments. The company was sold in April for $4 million. "That raised a bunch of question and has hampered a few cities from pushing ahead," said Clarke. 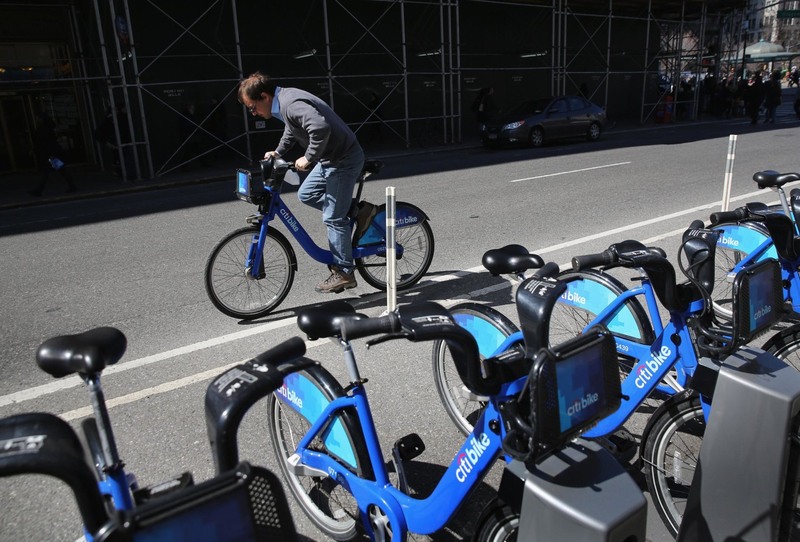 "They're asking more questions about the financial implications, but I don't think it will have much of a lasting effect on the take-up of bike share programs." Portland, Ore.-based Alta Bicycle Share, which manages bike-share programs in cities including Chicago, New York, Boston, and Washington, is working with 8D Technologies to begin installing improved docking and software systems in bike-share cities that once relied on Bixi. Seattle's Pronto program will be the first. The cost of setting up bike-share programs is also coming down. "When the bike-share concept came to the U.S. in 2010, it cost about $6,000 per bike to get on the street, including the kiosks, racks and installation," said Josh Squire, CEO of Miami-based CycleHop, which is working on launching programs in Tampa, Atlanta, Phoenix, Orlando, Louisville and Ottawa. Now with smart bikes and new technology, it's possible to get a program going for $3,000 to $5,000 per bike, said Squire. "And more sponsors — including banks, health care companies and, now, airlines — are stepping up to help shoulder the costs, paying $500 to $1,000 per year per bike to sponsor the programs." For travelers wanting to try out a bike-share program in a new city, Clarke has a few tips. Bring a helmet. And if you think you'll want a bike for a half or full day, consider getting one from a traditional bike rental outlet. That may end up being less expensive than bike-share programs, which often don't charge members for rides under 30 minutes, but start a meter running after that. "But in a city like Washington, D.C., that can still be cheaper than one cab ride," said Clarke. "And nothing beats the experience of riding up and down the National Mall on a bike."